Car Audio Tips Tricks and How To's : Chevy Sonic 20 Minute Amp Sub Install. If you're installing an amp for a aftermarket sub in a Second Generation Chevy Sonic, you're in luck! These vehicles are a breeze. The battery is located on the driver side, under the hood in the engine bay. 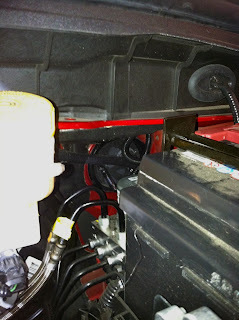 Right behind the battery you will see a large rubber grommet on the firewall, you can punch right threw that to run the main power wire into the cab of the vehicle. Be sure to avoid the main wire harness that goes threw that same rubber grommet! There should be plenty of room to run your power wire threw without coming close to those wires. 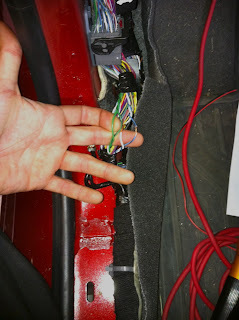 If you are going to be keeping the factory stereo, the rear speaker wires are located in the driver kick panel. You can connect your line out converter/hi-lo converter to these wires. 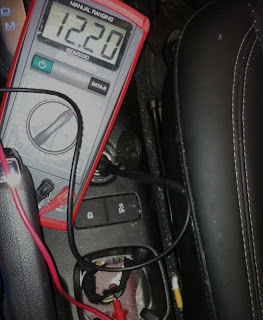 The speaker wires should be twisted, and should read about 4.2ohms on your multi meter. The rear left speaker positive should be "Green" & Negative should be "Green/Black. The rear right speaker positive should be "White" & Negative should be "Blue/Black"
You can grab your remote/amp turn on wire at the cigarette outlet plug. 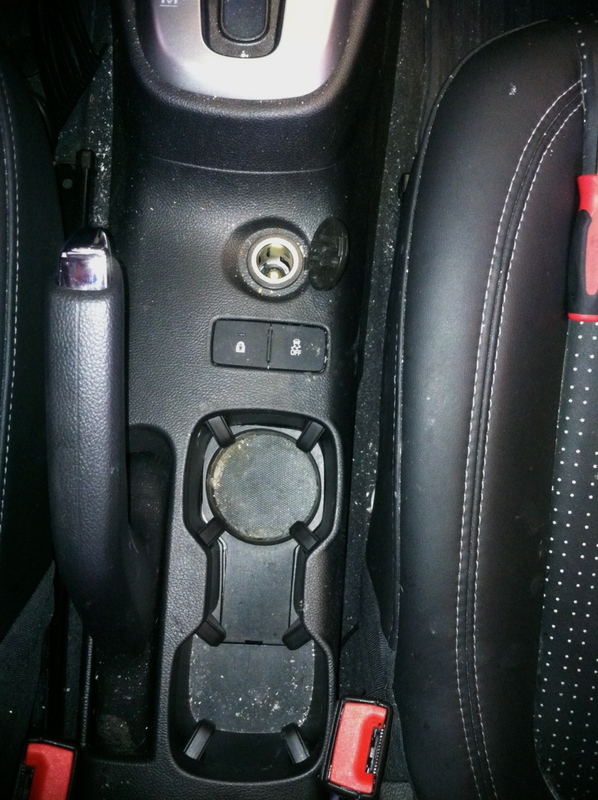 If you remove the bottom plastic piece in the cup holder, you can easily access the wires coming off the back of the cigarette outlet plug. They will be loomed in clothe tape. The "Purple/Yellow" should be the positive, and can be used to power your amp on/off with the ignition switch. You should always double check with multi meter just to make sure you have the right wire(s). Once you run all your wires to your amp, find yourself a good ground. I found a good ground right under the edge of the trunk liner. I attached a ground wire to the hollow metal support that raps around the opening of the trunk, closest to the rear fold down seats. Always double check to make sure there isn't anything that may be damaged by the screws used to mount and secure your ground wire. You will also want to remove the paint with a wire brush or sand paper, in the location you will be mounting your ground wire. Connect your sub(s) and you're done! And you didn't even have to remove the factory stereo! Where did you ground the sub? Hey Tommy Thanks for the comment. The Sonic I installed this amp in had a hollow metal support that went around the opening of the trunk, closest to the rear fold down seats. I grounded the amp on the side of the support right under the trunk liner. I will post a picture at the end of this post so you can get a better Idea of what I'm talking about. Sweet I hope this works! Hey Justine, you will need to tap into your speakers. I tapped into the rear speakers in the driver kick panel. If your amp has the option to connect speaker level input, you will just tap into the +/- of each rear speaker and then run the new wires into the amps speaker level AKA (Hi level) input. If your amp doesn't have the option, then you will need a Hi-Lo converter/adapter. They normally go for about $10-$20 at your local stereo shop. You will then tap the Hi-Lo into your speakers, and connect RCAs from the Hi-Lo converter/adapter to the amps Lo level input. Hope this helps. Hey Jeremy my naame also is Jeremy, I have the basic stereo which only has the front speakers, what colors would those wires be? and thanks for the awesome info. Gor the multimeter, what are u touching exactly for a 12.2 reading? Thanks for the post, saved me a tone of time trying to find the speaker wires. Also some thing that will save you a little time trying to find the remote power is to get a fuse tap and replace the fuse for the power outlet with that. The fuse is the third from the top on the right side of the fuse box under the dash on the driver side. Hi!! do you have any idea how to remove the radio? It is any secret you can teach me?? 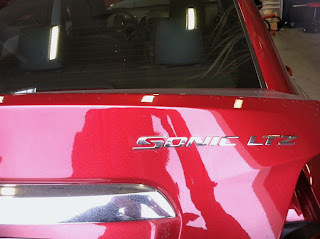 I alredy install amps in sonic but with the stock radio but now the customer wants to change it,thanks!! Yes, also need to know how to remove the stock touchscreen radio. Anyone know? 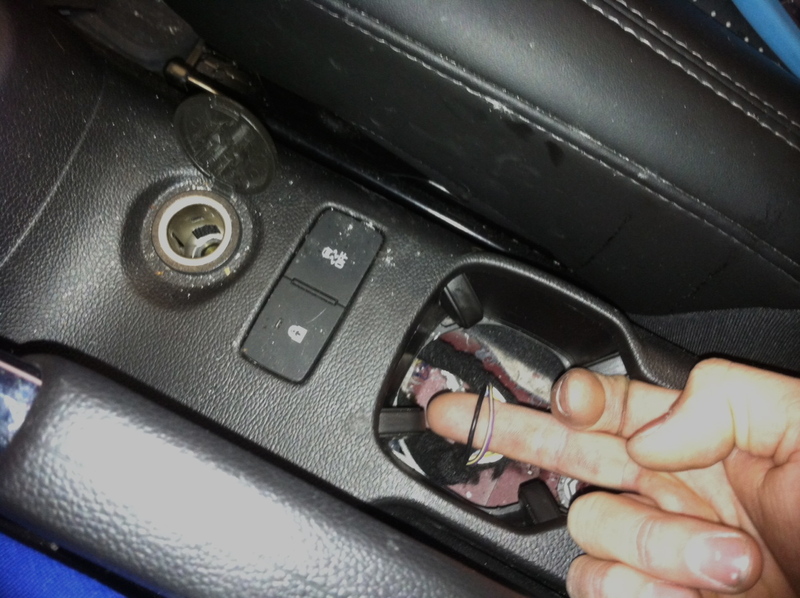 Hey, quick question: I'm trying to install a CB radio in my 2013 Sonic and have settled on tapping into the cigarette outlet power. Through this forum, I have been able to determine that the positive wire is "Purple/Yellow", but what is the negative wire color? Thanks for any help! Is this the same wireing for the 2014 sonic LT with touch screen?? I followed step by step and everything was correct. The only thing I had a little trouble with was when I put the plastic cover back on. The converter is tight right up against the panel. They don't give you much wire's length but it works and sounds great. Hey, did you leave the converter in the drivers side kick panel with all those wires or did you run it with some sort of extensions all the way back to the trunk? What about the remote power wire? Hey did you leave the converter box by the drivers side kick panel with all those wires or did you run it all the way back with extension wire to the trunk? what about the remote power wire? If so what type of wire did you use? Easy Way To Divide Voltage Using Resistors. 99-04 Toyota Avalon Factory Sub Replacement. Toyota Tundra Factory Amp Bypass. Quick Tip When Replacing Stereo In An Older BMW.